In his day Ian Fleming used to be not just a journalist and author, he also was – little surprise there – an avid writer of letters. Over the years he corresponded with famous contemporaries and friends – amongst them Raymond Chandler, Somerset Maugham and Noël Coward – as well as with editors, readers and fans all over the globe. 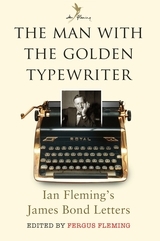 Ian Fleming’s nephew Fergus Fleming now compiled and edited a volume of Ian Fleming’s Bond-related letters that Bloomsbury publishes this Thursday, October 8th. On 400 pages readers will catch a backstage glimpse of Fleming’s writing process, on the thought process that went into many curious details of the original Bond novels, and also on the effect the Bond phenomenon had on his creator. You can order the book at Amazon UK and of course also at your local bookstore. Fans in the United States will have to be patient until November 3rd.